This mitigation for a homeowner in Swanton was a little more tricky than most. SERVPRO of Burlington/ Middlebury's team had to come up with a way to remove mold covered contents without disturbing the surrounding environment with mold spores. The solution was to build a tunnel from the back room of the basement to the front door. 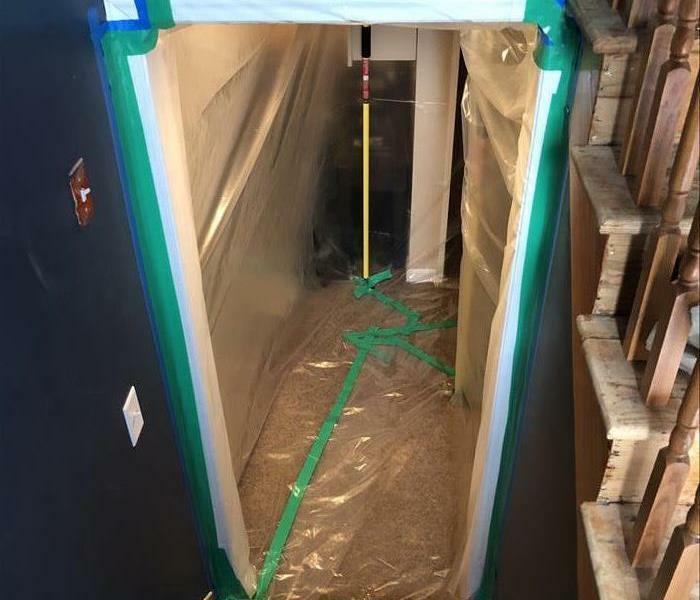 This allowed our team to make sure that all of the issues that could arise with taking mold covered contents out of a home were minimized completely. This attention to detail is exactly the reason the SERVPRO of Burlington/ Middlebury is Vermont's best choice for mold remediation and Water mitigation. It's not just a matter of completing the job to us. It's a matter of doing it correctly. This Williston based hotel quickly got a hold of the SERVPRO of Burlington/ Middlebury when their sprinkler line froze and broke one Saturday morning in January. 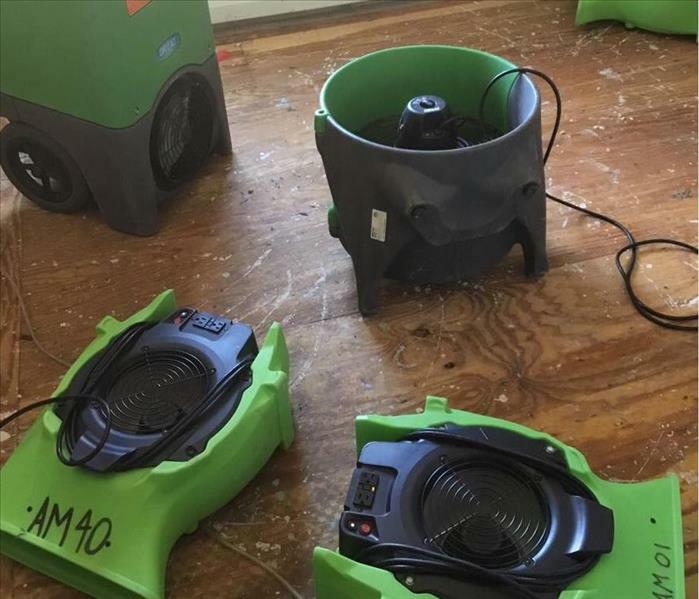 SERVPRO of Burlington/ Middlebury was quickly on the scene with a team of experts ready to help get the flooded ground floor of the hotel back up and running as quickly as possible. After 4 days of drying, the hotel was able to begin re-opening some of the rooms that had been affected by the flood. This is a perfect example of why the SERVPRO of Burlington/ Middlebury is the best choice for your restoration needs. When your company needs help on a commercial scale, we're ready 24 hours a day @ 802-497-1101. This Milton Homeowner needed our help when their water line broke going to their refrigerator when they were out of town. SERVPRO's team of AMRT certified technicians quickly grabbed a hold of the situation and made sure the problems in the home were properly identified. After Industrial Hygienist testing, our teams were able to identify the issues that needed to be handled and scope the mold loss properly. The mold issues were taken care of by our teams over the course of the following week, and the homeowner could not have been happier with the results. This Randolph homeowner needed our help after his toilet supply line burst soaking his carpet in the adjacent bedroom. he was quick to call the SERVPRO of Burlington/ Middlebury and we responded within the hour. Stories like this one are perfect examples of why people in Vermont trust our team when their home suffers a pipe break, a flood, an overflow or a groundwater intrusion. our teams are always ready to help. 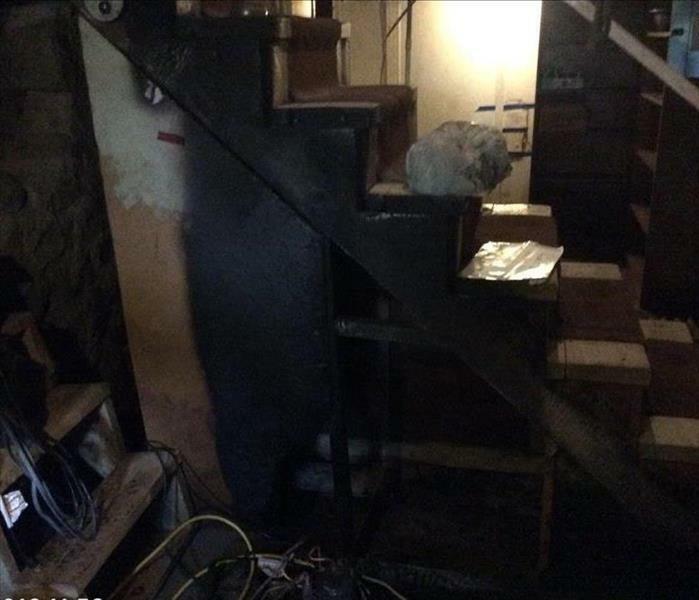 If you have water damage in your home, call the experts at SERVPRO Burlington/ Middlebury @ 802-497-1101 today and let us help you make it "Like it never even happened"
This basement fire was one that the homeowners needed us to take care of right away. We jumped straight into action to make it "Like it never even happened." This company called us to their facility when one of their chefs had left a burner on and caught some bread on fire. We were quick to respond to their needs and got right to work 2 hours after the loss had happened. Here at SERVPRO, we know exactly how damaging smoke in a home can really be. We have dedicated our time to learning the most effective ways to handle all of the possible complications that can arise in a home. If you've recently incurred damage at your residential or commercial property, please don't hesitate to call SERVPRO of Burlington/ Middlebury at 802-497-1101, and we'll make it "Like it never even happened." This Vermont Company called us in when they noticed a few of their vats were causing some suspect microbial growth on the facility ceilings. Lucky for them, SERVPRO knew just what to do! Here at SERVPRO, we know exactly how damaging unintended water in a home can really be. We have dedicated our time to learning the most effective ways to handle all of the possible complications that can arise in a home. Floods can happen any time. This business owner needed us in a hurry when his operation was flooded by storms that blew through our area. We were quickly onsite and had his business back up and running in a limited capacity in a few hours! In especially happy customers homes', Sometimes its important to take a moment and appreciate the work you've done. Especially when your customers are extremely pleased. This Homeowner had a beautiful historic wide plank floor that we spent a week drying out. It was well worth the time because when we were finished, we truly got to see how gorgeous this floor was. This S. Burlington homeowner called us when his sink overflowed onto his hardwood floor. We were quick to respond with our mat system and saved this hardwood floor. This company in Essex needed us to come out and take care of their building after they were flooded from heavy storms. 2 days later they were setting up meeting rooms in the midst of cuts. We needed to get this company back on their feet fast when they had a water loss. Lucky for them we were ready! This mold mitigation had gone on, hidden inside a wall so the homeowner had no idea the damage had taken place as long as it had. The spores had made similar patterns to sporing mushrooms! This is a photo taken from an apartment in downtown Burlington. When the owner of this property indicated to us that his tenants had suffered a fire loss, we jumped right into action. This is a friendly reminder that a stationary heater is not an appropriate place to dry off your clothes!! This fire took some charring from an electric water heating unit in a basement. The smoke traveled through the home and put some everywhere and on every surface. SERVPRO of Burlington/ Middlebury had these folks back in their home within a week of our mitigation start! This Hinesburg, Vermont home had some serious mold intrusion taking place in it after it had been abandoned for a few years. The SERVPRO of Burlington/ Middlebury quickly jumped into action and made the mold "Like it never even happened". We were happy to make this home complete again. When a contractor made a mess of one of our customers garages, SERVPRO of Burlington/ Middlebury sprang into action. We were on the scene very quickly and got the majority of the work done within 2 hours!!! 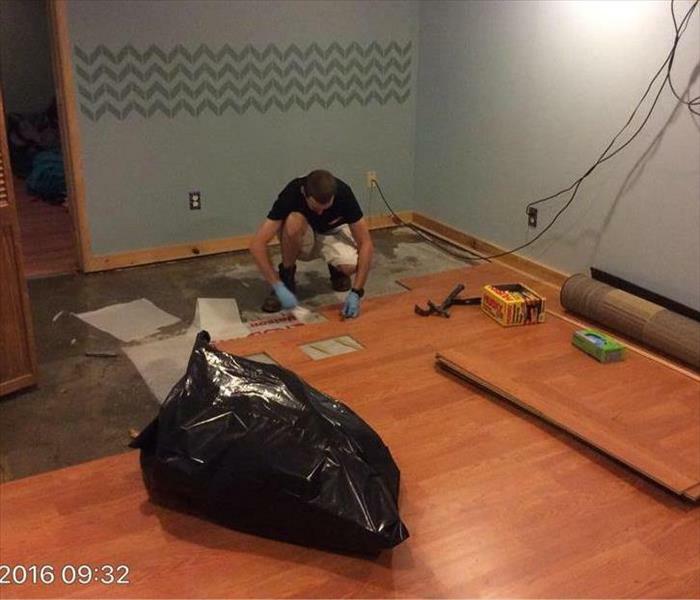 When this water loss took place in Middlebury, Vermont, SERVPRO of Burlington/ Middlebury jumped into action for the homeowners. We made sure to promptly arrive in this fine home and remove a sleeper floor in order to get to the water resting underneath. While Hurricane Harvey and Irma were taking place down south, up here in the north we received a lot of heavy rain. During one of our large storms, heavy rain fall caused the Hannafords Supermarket located in Williston, VT to have a water loss in both their grocery area and in their entry way. The rain was coming down so fast and hard that it didn't take long to flood the floors. SERVPRO of Burlington/Middlebury responded to the call immediately to get the floors dried and make it so Hannafords was able to open to the public ASAP and run their normal business hours. This picture is of some of the drying equipment used for a water loss like this. This happens to be a drying fan and a dehumidifier in the entry way of the supermarket. FedEx had experienced a water loss over the summer that they called SERVPRO of Burlington/Middlebury to come restore. During the water restoration process, the technicians found mold. Later this fall, a mold mitigation was performed on both the Women's and the Men's bathrooms where the mold was found. The photo shows the shower of the Women's room covered in mold. The mold wasn't completely visible because it was under the shell of the shower and this is what it looked like after removing the outside cover of the shower. This photo was from an emergency water loss at Colorlab Cosmetics located in Williston, VT. The factory and office got soaked with water after a pipe burst during the night. The employees came in the morning to a very wet office and factory. The water caused a lot of damage to not only the property, but to the cosmetics and ingredients that ran all over the floors and walls. SERVPRO of Burlington/Middlebury responded immediately to the loss and started the restoration process. Before a cleaning could be done, the areas first needed to be properly dried which is what the photo above is showing. After SERVPRO of Burlington/Middlebury performed the water restoration, and a thorough cleaning, mold was also found. At this time, SERVPRO performed a small mold mitigation for Colorlab as well. A backed up shower caused a water loss in this families home. The water from the shower overflowed onto the bathroom floor and made its way to other areas of the house. 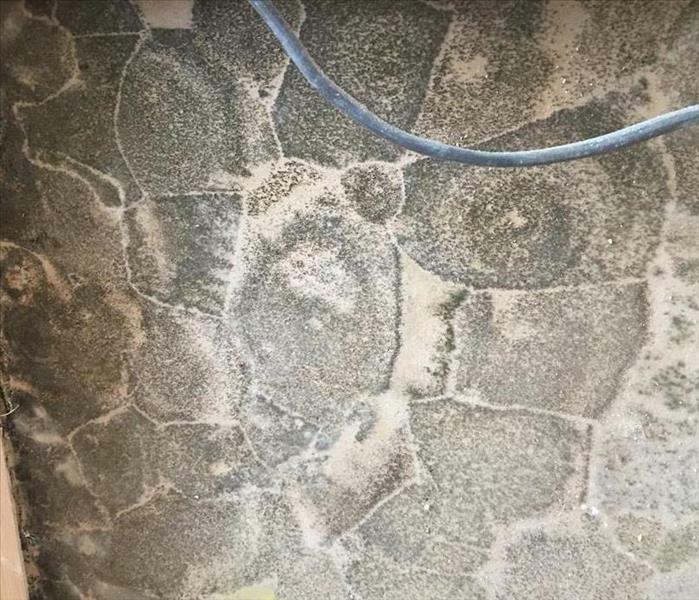 In the picture shown, you can see how a tech from SERVPRO of Burlington/Middlebury had to tear up the flooring to dry the underneath layers to avoid the growth of mold. Trinity United Methodist Church had a large sewage back up starting from the restroom and spread through the entire floor of the church. SERVPRO of Burlington/Middlebury was contacted to clean up the floors, carpets, and walls. The photo here shows the original source of the loss. During a heavy snow fall, the business REMAX had a wet office due to snow melting and entering the business through the ceiling. As you can see in the picture, a window that is placed in the ceiling was the cause of the loss. The water came through the window and spread through the ceiling tiles and also down into the carpets. SERVPRO of Burlington/Middlebury dried all the carpeting and took down the damaged ceiling tile to prevent it from collapsing. A home owner in South Burlington, VT called SERVPRO of Burlington/Middlebury when their washing machine backed up and over flowed into their living area. The picture shows some of SERVPROs fans and dehumidifier that is used during a water restoration process to dry out the wet areas. A storm in Shelburne, VT cause substantial flooding in this basement. Even with this amount of water, SERVPRO of Burlington/Middlebury was able to drain the high level of water and dry out the basement along with the residence's contents. Mold isn't always visible on the outside of walls, ceilings, etc. This picture shows the inside of a clients wall where the insulation had been exposed to moisture and caused mold to appear. If not taken care of, the mold will continue to grow and spread through the houses fixture and eventually will be visible inside. If you think you have mold but cannot see it, SERVPRO of Burlington/Middlebury has a tool that our professional crew members use to measures the amount of moisture in your walls, floors, and ceilings. 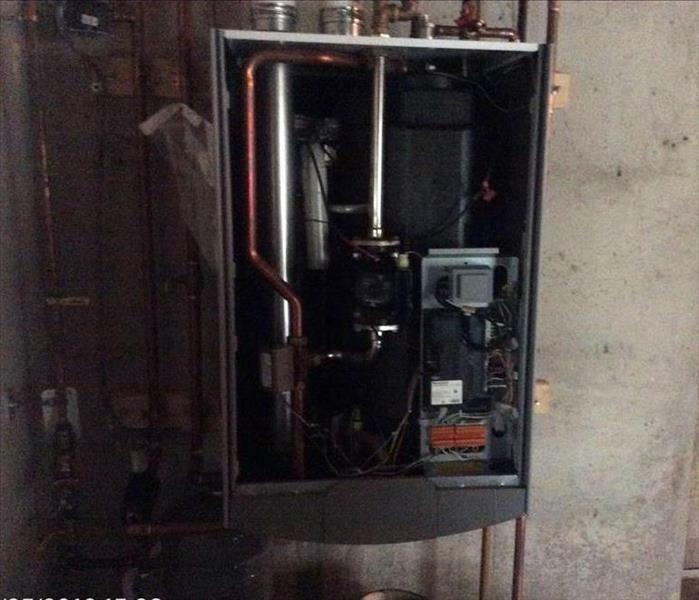 Adams School located in Burlington, VT called SERVPRO when there was water coming through the radiators instead of heat! A water pipe that runs through the heaters broke and administration walked into a wet mess but with SERVPRO of Burlington/Middlebury's emergency services - we had Adams School back up and running in the matter of a day. This is the left over damage of a candle that caught fire and left soot all over the residents home like the example in the picture. SERVPRO of Burlington/Middlebury was there to remove the soot and made it look "Like it never even happened." Green Mountain Beverage located in Middlebury, VT called SERVPRO of Burlington/Middlebury for a commercial water loss. 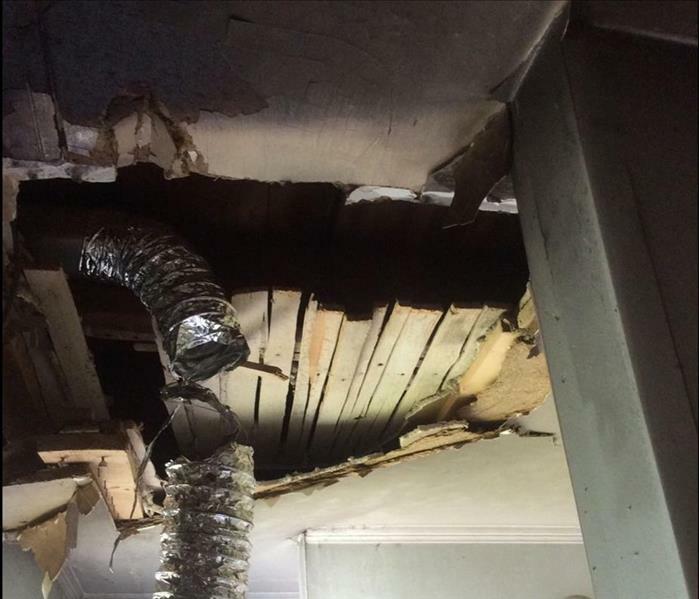 A sprinkler pipe bursting above their office space caused water damage to seep through the tile ceiling and into the carpet below. A little toaster caused a big fire in Burlington, VT. SERVPRO of Burlington/Middlebury was called for a fire restoration caused by the toaster catching fire. The team cleaned and sorted through all effected contents of the home and got the residence back to their normal living situation in no time. This photo shows the damage to a basement in Williston, VT caused by a rain storm that was so intense it caused the basement to flood. SERVPRO of Burlington/Middlebury was called to the rescue to clean out the water and dry out the effected area along with the damaged belongings of the homeowner. 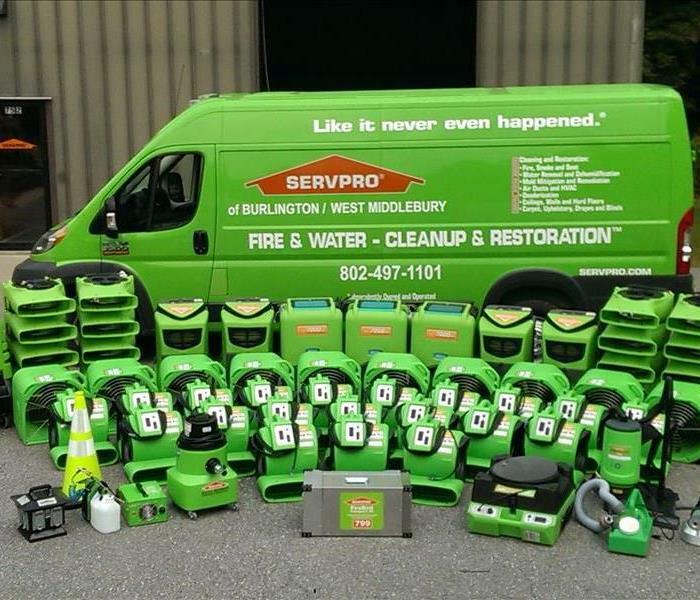 Our team at SERVPRO of Burlington/Middlebury is well equiped to respond to any sized disaster faster! We respond to emergency calls 24/7, helping to assist our customers to get back to "Like it never even happened"
The motto at Sugarbush is "Be Better Here" so what better way for our team to get out and work towards just that? The biggest common tread among our team (other than our love of the industry) is that we all love to snowboard! 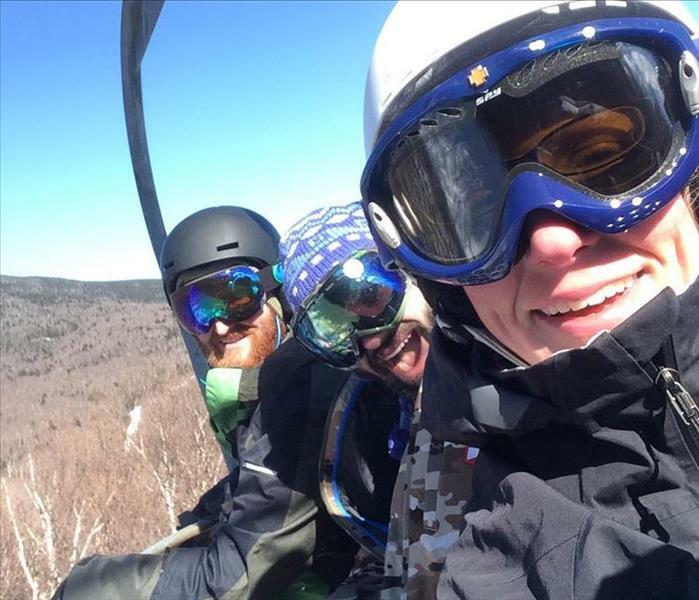 The Green Team hit the slopes to enjoy some late season turns in Spring 2016. We're already daydreaming of getting back out there to make some more and continuing our work/life balance! Shawn celebrated his birthday this week and received a super cool high powered magnet as a gift. Our crews spent some time playing with this monster magnet, but not before making sure our phones were all safe! Put your phone is the basket before testing out the magnet, folks!